Portugal is probably the cheapest country in western Europe for visitors. It’s also a member of the EU and uses the Euro – making life so much easier if you’re on a longer cycling trip and crossing from or into Spain. There are cash machines everywhere in Portugal – finding somewhere to draw out money is rarely a problem, even in the smallest towns. Flying into Portugal, there are ATMs inside the airports and – depending on your bank – you’ll probably get a much better exchange rate withdrawing money direct from your account than using one of the exchange counters. As well as at banks, you can also find ATMs inside most supermarkets, shopping centres etc. 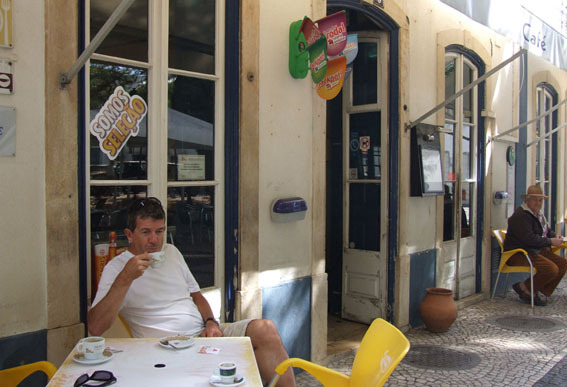 Cafe culture isn’t expensive in Portugal. If you’re on a tight budget, Portugal is a good place to come. Prices vary depending whether you’re in an out-of-the-way provincial town or busy tourist trap but even at the higher end of the scale things are generally a lot cheaper than in places like the UK or France. If you want to keep costs down, buy goods produced in Portugal. Anything that’s imported – like certain brands of cereal, toiletries, chocolate etc – can be pricey. Buy local and you’re not only improving your green credentials but you’ll also be better off! For touring cyclists, your main costs are going to be food and accommodation. If you’re camping and cooking for yourself, a budget of €20/day shouldn’t be too difficult to live on. If you’re staying in basic guesthouses and having one meal a day in a cafe then the minimum is probably going to be more like €35. Obviously, the more you spend, the better your degree of comfort. If you want to stay in fancy (luxurious) accommodation, eat out for lunch and dinner, have a few beers and a bit of spending money for entrance fees, souvenirs etc then €90-100 per day should be very comfortable.